Today we are on part 3 of 6 of our Barry M Dazzle Dust swatches! 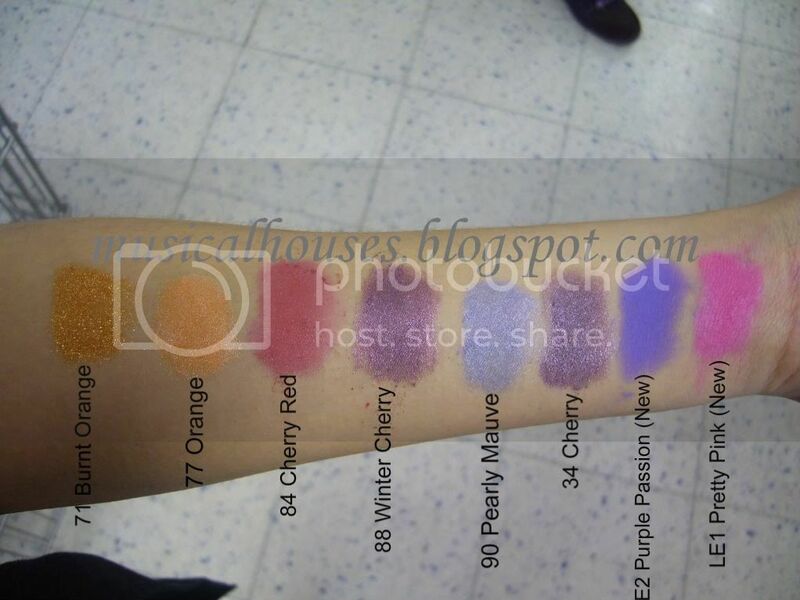 Today's swatches are of a varying bunch of colours, featuring orange, reds and some purples. There's also the appearance of a matte Dazzle Dust, the comparatively rare creature. Burnt Orange 71 is a glittery bright orange. It's a great colour if you like something bright with visible glitter. It really pops on my arm. Orange 77 is also orange, but a bit paler. This one has no visible glitter, but a smooth shiny frosty, pearly finish instead. Cherry Red 84 is a red that leans more to the cool side. It does sort of remind me of cherries. It also has a shiny frosty finish, although the finish is a lot more toned down than Orange 77. Winter Cherry 88 is a beautiful colour. It's a purple, but with a red tone to it, and a shimmery pearly finish that makes it glow. I like this colour. Pearly Mauve 90 isn't quite mauve, but it's a very pretty violet or periwinkle colour. It's pretty though, and yes it does have a pearly frosty sort of finish that's glowy. Cherry 34 is similar to Cherry Red 84, but it has less red. This one is more blue-based, but it has the same finish as Cherry Red. Purple Passion LE2 is pretty cool - it's neon, and it's matte. Neon matte violet. 'Nuff said. Pretty Pink LE1 is a shimmery hot pink that leans cool - it's a pink with good amounts of blue in it. It's also got that shimmery, pearly finish that's similar to Winter Cherry and Pearly Mauve, just more toned down. Purple Passion Looks Crazy! I want it! i'm so glad you visited my blog because otherwise i'd never had discovered yours! i'm such a makeup/nail polish addict too, and i love the way you do the swatches and test the colors. one of the better beauty blogs!